My mother always wears red lipstick. I’ve never seen her wear any other color, and it’s almost as if the lipstick is a part of her. …and I may have also grafftied several walls with those lipsticks…. Because of the lipstick, the first color that comes to my mind when I think of my mother is a bright, vibrant red, which is what inspired this cake for her. 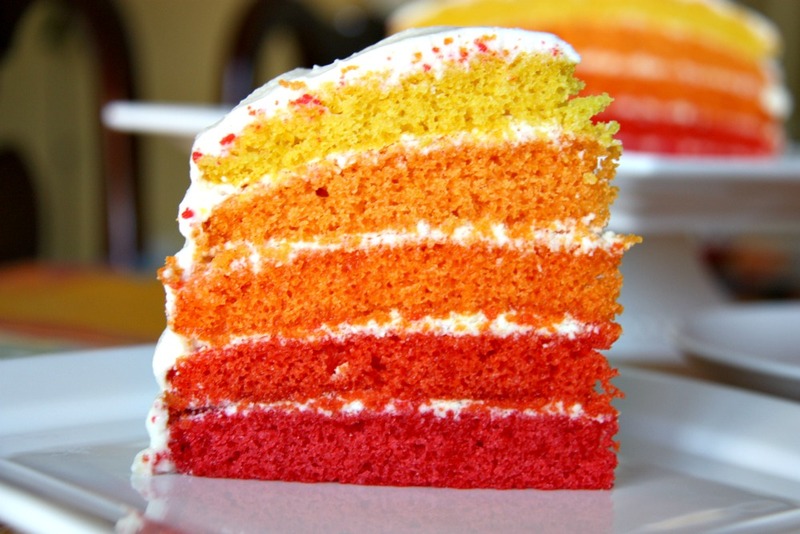 My original idea was to have a rainbow cake with six layers, however, I felt that was too random. I still wanted to do a colorful cake however, so I thought of the various pictures of Pantone swatches I’ve been seeing on pinterest and tumblr lately, deciding to do a red gradient cake. One problem remained: usually when you do a gradient of red, it starts out pink, and pink was not a color I associated with my mother’s character at all, thus I did a yellow to red gradient instead, which also reminded me of summer, her favorite season. I had very little time, so by the time the cake layers were baked and ready to use, I didn’t have time to whip up icing, crumb coat the cake, wait for it to dry and then ice the entire thing. Instead I just used a white chocolate glaze on the whole thing, which I now regret doing because the cake with glaze doesn’t taste as great as cake with icing. However by itself, it was great,with a soft and spongy texture. For that reason, I’m only going to include the cake’s recipe, not the glaze, so instead I reccomend pairing the cake with swiss meringue butter cream(for which Kaitlin of Whisk Kid has an amazing step by step guide for). Red and Yellow food coloring. 1st bowl: add as many drops as red food coloring as you want until it looks vibrant enough to you. 2nd bowl: add and yellow food coloring, and keep it to a ratio of 2 red drops to every one red drop(so basically if you ad five yellow drops, then you have to add ten red drops, that way it makes it more of a reddish orange). Don’t start out with ten yellow drops then, have to put in twenty red drops, the mixture will probably be overwhelmed by red, and it won’t look too different from the plain red. Start out with about four yellow drops and add eight yellow drops, until it looks like an orange tinged red to you. 3rd bowl: add red and yellow food coloring in equal amounts to make a regular orange. 4th bowl: add red in yellow food coloring, in the reversed ratio thats in the 2nd bowl, so basically 1 red drop to two yellow drops, to make a lighter more yellowy orange. I’ve only given you the ratio for the colors because I did this entirely by how it looked to me, and if the color of the batter was vibrant enough, so, keep in mind, that whatever color you see in the batter is exactly the color it will be after it bakes, it won’t darken or lighten or anything. When you remove them from the oven, let them rest on the cooling rack, in the pan, for ten minutes, then remove it from the pan, and cover it and put it in the fridge to cool quickly, and then frost them with whatever you like. 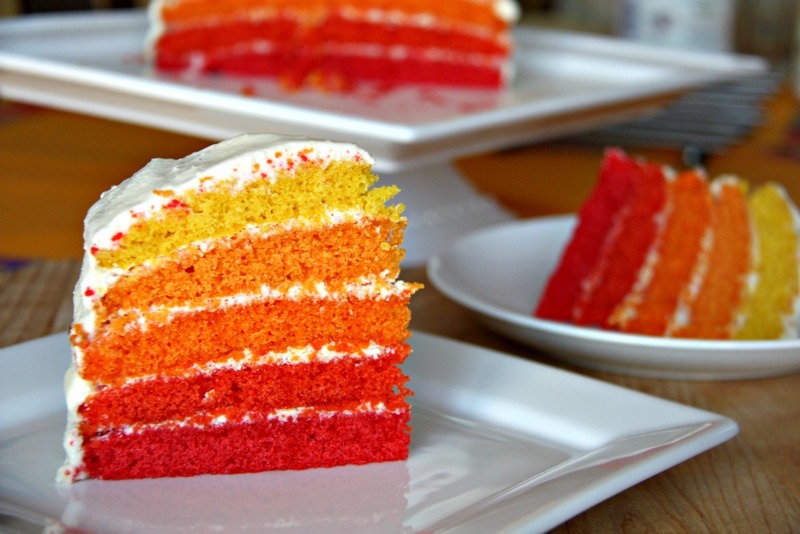 Tip for frosting: Do a crumb coat, since this is a extremely colorful cake, any stray crumbs from the cake will look really bad if it gets into the icing. for those who don’t know: a crumb coat is a thin layer of icing that you put on the cake and let it dry so that a layer forms around the cake to prevent crumbs from straying into the whiteness of your icing. Wow… This is ridiculously pretty! So much energy and fun in this cake! Beautiful for Mother’s Day, but I think I may try this out for my daughter’s graduation party this weekend! This is a fun cake. Thanks for sharing…your photos are gorgeous! Your photography is simply awesome Didi….and I’m sure the cake was delicious. Lucky mama…. That looks awesome! Love it. 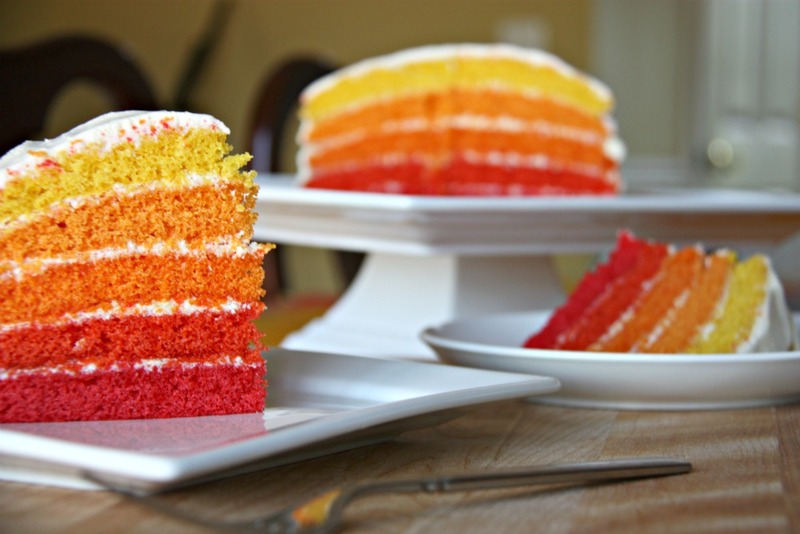 Ombre cakes are always so pretty! Your pantone cake is amazing! Love the color gradient idea!